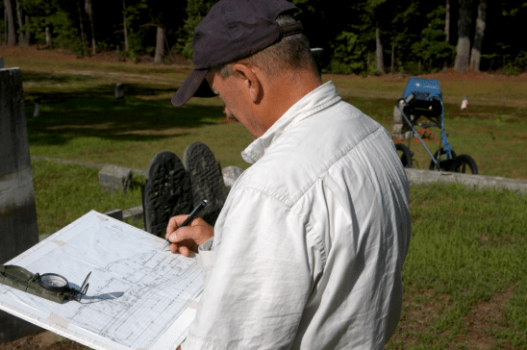 Our Cemetery Mapping Service utilizes Ground Penetrating Radar and GPS technology to provide detailed and accurate maps of the Cemetery property. In other words, a Cemetery Mapping survey provides detailed gravesite mappings that are true depictions of the property. Furthermore, we utilize a number of Gravesite mapping services to obtain the highest accuracy possible. These services include GPS survey, Ground Penetrating Radar and onsite drafts to collect details of the cemetery property and infrastructure. We begin our Gravesite Mapping Service with a site survey and walkthrough of the cemetery property. We collect GPS data and check measurements of walkways, tree lines, roadways, building, gates, and other identifying features. In addition, we mark the location of park benches, water lines, drainage systems, and fencing that are used as visual landmarks on your maps. 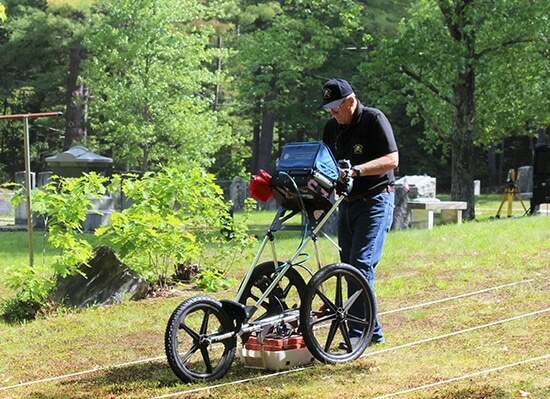 Ground Penetrating Radar surveys edges of roadways and areas suspected of encroaching on adjoining grave space. Finally, we put together a media study of your cemetery that includes photographic and site videos of key areas. The media files aid us in mapping and reviewing questionable areas and terrain.